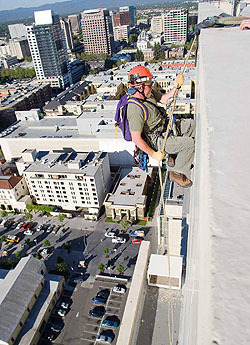 Clara, a peregrine falcon nesting on the San Jose City Hall building, wheels in the sky (above) as UCSC biologist Brian Latta (below) climbs down to the nest box to band her chicks. Photos copyright Nick Dunlop. Wildlife biologist Glenn Stewart is both pleased and amused at the huge popularity of the webcams he has helped set up to allow people to watch peregrine falcons in action. This year, the big hit with falcon-watchers has been the webcam at San Jose City Hall and a pair of falcons named Carlos and Clara, who are now raising three healthy chicks in a nest box provided by researchers with the Santa Cruz Predatory Bird Research Group (SCPBRG) at UC Santa Cruz. "It's a unique opportunity to see a falcon's home life," said Stewart, coordinator of the SCPBRG. The webcam monitoring the San Jose nest box has averaged 18,000 visits daily since the chicks hatched on April 22. San Jose Mayor Chuck Reed and his office have been enthusiastic participants in this online reality show, issuing regular press releases with updates on the City Hall falcon family. For weeks the mayor's web site promoted a "Name That Falcon" contest for San Jose kids to name the three chicks. The City of San Jose also provides funding ($45,000 this year) to support SCPBRG's work with the falcons and its outreach programs in local schools. On May 16, crowds gathered to watch along with the mayor and local media as SCPBRG researcher Brian Latta rappelled down to the nest box from the top of City Hall to place identifying bands on the legs of the chicks. He also determined that two of them were females and the third a male. One egg in the nest failed to hatch. Stewart has roped in four research interns to help "drive" the webcam in San Jose--remotely operating the camera from their computers--because viewers don't want to miss any of the action going on in the nest box. The camera has spawned an online discussion group with more than 1,700 members; Stewart and other SCPBRG researchers use this group as a venue to answer questions and allay fears, since many of the members could probably rival Carlos and Clara in parental anxiety over the chicks' every move. For example, many viewers aren't aware that falcon chicks look completely identical, Stewart said. "People will say, 'The one in the back isn't being fed; you have to do something.' Well, he may have been the one in the front before. Maybe he got really tanked up and wants to sleep now." While the chicks are certainly cute, viewers aren't spared the grisly sight of hungry falcons feasting on their favorite prey: smaller birds. "They've even seen a parent return with prey that was still alive and twitching," said Jaime Jansen, one of Stewart's interns and a junior majoring in anthropology at UCSC. "But that's real life. People need to expect that not everything is going to be pretty." In previous years, thousands of viewers watched falcons Sadie and Jimbo raise a family of chicks on top of the Oracle headquarters in Redwood City, and cheered George and Gracie's public courtship on the 33rd floor of the PG&E building in downtown San Francisco. In fact, people are still grieving over George and Gracie's disappearance, after the falcons were driven away by another pair. "People actually saw the battle taking place in the air between the falcons," Stewart said, "but I guarantee no one would ever have noticed if we hadn't let them get involved through the webcams." Rather than just gaze at computer screens, many enthusiastic falcon-watchers have purchased binoculars so they can watch the birds outside, or visited other nest sites in the wild, which Stewart finds particularly gratifying. "There's a guy who goes out to Pier 14 [in San Francisco] every day during his lunch hour to watch the birds," he said. "For a long time, he was watching for George and Gracie to come back. Now he reports to us about the territorial pair nesting on the Bay Bridge." "For me, it's not about turning people into biologists, but getting them to pay attention to what's going on," Stewart added. "Now they're not just watching peregrines; they're also seeing the coyote, the bobcat. We're talking about a legal secretary, a draftsman, a broker--people who absolutely weren't doing this before." 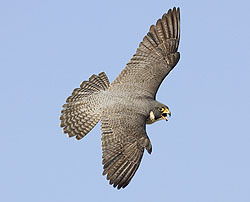 Peregrine falcons have come a long way since 1970, when there were only two pairs left in California. At that point, DDT and other pesticides had all but driven them to extinction, causing female falcons to produce thin-shelled eggs that cracked under the weight of maternal incubation. Stewart and colleagues scoured the cliffs in search of the few remaining nests, retrieved the fragile falcon eggs, and brought them back to the safety of special incubators at the SCPBRG research facility. "Dummy" eggs (courtesy of the UCSC Art Department) kept the parents on their nests until the researchers could return the successfully hatched chicks. For many years, the group also bred peregrine falcons and other birds of prey in a captive-breeding facility on the UCSC campus. They released the captive-bred falcons in a "soft" release process, supplying fresh quail every day until the birds learned to hunt on their own. Although the group no longer operates its own captive-breeding facility, the researchers continue to release falcons raised in captivity into the wild. In fact, they know from the leg bands on Carlos that he is not just any tiercel (male falcon), but a captive-raised bird they released at UCSC's Long Marine Laboratory in 2006. Today, SCPBRG researchers estimate that there are as many as 233 falcon pairs in the state. "They've reestablished most of the classic nesting places like Morro Rock; now they're going for tall buildings and bridges," Stewart said. "I've revised my description of peregrines from 'they nest on cliffs' to 'they nest on structures that dominate the landscape.' Morro Rock dominates the landscape the same way San Jose City Hall does. So there's nothing artificial about the birds in San Jose; they're a wild pair of falcons like any others." Stewart calls himself a cheerleader for every pair of peregrines in California, with no favorites. Others, however, often get very attached to particular birds. For instance, a different male, Jose, was Clara's mate last year, and many people are still wondering why Carlos took his place. "Things happen, and we can't get sentimental about every bird that's out there," Stewart said. Peregrines usually mate for life, and researchers have observed that, more often than not, they return to the same nests each year. "But if one doesn't show up, another will," he said. "They're not going to not breed." Stewart conducts education and outreach programs at schools throughout central California, where he talks not only about peregrine recovery efforts, but also about his job as a wildlife biologist. "I tell them about putting satellite transmitters on bald eagles, and show them pictures of biologists doing work on the Channel Islands," he said. "Pretty soon, they're convinced that it's pretty exciting work if you have a helicopter, a yacht, and a floatplane involved. It gets them away from the stereotype that a scientist is a white-coat guy in a lab with beakers. Some scientists work outside and still accomplish things that, quite honestly, change the world."